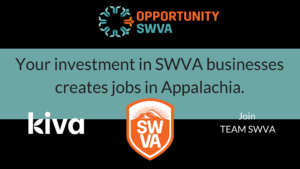 GIVE A WORTHY ENTREPRENEUR A LOAN: Join the SWVA funders team. Start an account on Kiva and get ready to start loaning money to entrepreneurs in your region and community. We’ve gotten three businesses funded by actively recruiting lenders: an outdoor companies, a manufacturer, and a restaurant and brewery. Each has a powerful story of the role of businesses in our region and in their communities. Watch for more SWVA businesses to be posted in the first half of 2019. Find our borrowers here. Make sure you join Team SWVA. Our 25 members have funded $775 in loans. Get a quick video overview of the job-creating impact your loan can have. Hear what it feels like when someone gives you a Kiva loan.